Your crawl space plays a key role in your home's structural integrity by bearing the weight of the home through the foundation walls and crawl space support columns. However, many crawl spaces are designed with a support system that is either inadequate, rotting, or has soils underneath the support posts that cannot support the weight of your home. 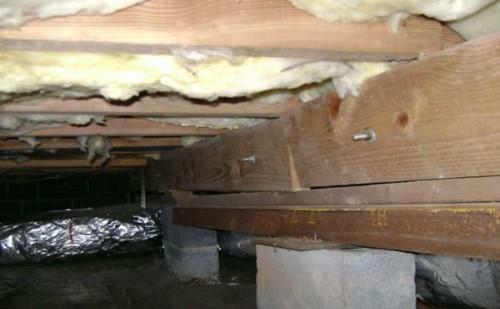 At Clarke Basement Systems, we can restore your crawl space's structural integrity with our crawl space support jacks. If you have sagging or bouncy floors, our system is the proven, effective repair solution you need. Call us today or click below to get a free estimate in Vaughan, Markham, Mississauga and the nearby areas! Failing crawl space supports such as the ones above with cause sagging or bouncy floors, and can eventually lead to severe structural damage. Our SmartJack® crawl space support jack system will provide a stable, long-lasting solution to your crawl space structural issues. Sinking crawl space supports: Sometimes, crawl space support pillars are built on soils that are not strong enough to support the weight of your home. Over time, these supports will begin to sink into the soil. As they do, the floor they hold up will sink as well, leading to uneven floors and interior wall cracking. Inadequate structural design: Sometimes, the contractor who builds a home will improperly space out the support beams that hold up your floor and interior structure. When this happens, the floor may sink in the spans between each support, leading to damage to your home structure. Rotting floor joists: When crawl spaces are damp, humid, or experience flooding, they become an ideal environment for mold and rot. Termites, carpenter ants, wood-eating beetles, and other damaging insects may also feed on organic materials in the crawl space. As the wood deteriorates, it will no longer be able to support your home, leading to significant structural damage. Foundation failure: The foundation walls themselves can fail in a large number of ways. Most commonly, these walls will be damaged by foundation settling due to poor supporting soils. It's also very common for the walls to buckle inwards due to pressure from expansive soils outside the home. If you have a structural issue with your foundation, it's important to contact a foundation specialist right away. At Clarke Basement Systems, our solution to failing crawl space supports is the SmartJack® Crawl Space Stabilizer, an adjustable supplemental support system used for sagging crawl spaces. This system not only provides supplemental support to your failing structure -- it can also often lift failing floor joists or beams, restoring them to their original position. This crawl space support system is unique in that it's made with strong, corrosion-resistant, galvanized steel. SmartJack® posts will not develop rust, meaning it will remain adjustable for years if you need to perform future adjustments. Superior support: Our support jacks do more than merely halt the downward movement of your floor. The SmartJack® may also be adjusted to try to lift the floor above to its original position. If you have failing crawl space supports or sagging floors over the crawl space, Clarke Basement Systems is here to help. We're the local crawl space repair experts, and our proven support jacks can restore and stabilize your crawl space and the floors above. Call us today at 1-844-225-6185 or contact us online to get started with a free estimate in Vaughan, Markham, Mississauga, Brampton, Vaughan, Oshawa, Richmond Hill, Barrie, Peterborough, Newmarket and the surrounding areas.